Solid well lit hangars are one of the keys to safe efficient aircraft maintenance. The hangars at the airport were allowed to deteriorate, apparently without any intervention from the City. COLUMBIA COUNTY, FL – This past Thursday night, February 9, the Columbia County 5 met to rubber stamp a request by Lake City to partner in funding the required 30% match in a $2.7 million Rural Infrastructure Fund (RIF) economic development grant from the state of Florida Department of Economic Opportunity (DEO). 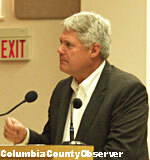 Lake City was looking for Columbia County taxpayers to contribute $465,359 to the City so it could apply for the grant. This is the second RIF grant applied for by Lake City in two years. In December 2014, the Columbia County 5 donated $474,250 to Lake City for the construction and refurbishing of two of the City's airport hangars. Hong Kong Aircraft Engineering Company Limited (HAECO), formerly TIMCO, uses the hangars to conduct its ever increasing aircraft renovation business. In 2014, then County Manager Dale Williams insured the supporting material was provided to both the County 5 and the public before any decisions were made. This material included the relevant parts of the grant application and all dollar amounts and explanations for the improvements. County Attorney Joel Foreman did not have a copy of the grant application. The interlocal agreement, which he approved for legal sufficiency, was based on the grant application. The County brass did not give Econ Dev Dir Hunter much microphone time. County Manager Ben Scott told your reporter after the meeting, that he thought the grant application had nothing to do with the interlocal agreement. It appeared he didn't have a copy of the grant application until late in the day on February 9. Before the meeting, Economic Development Director Glenn Hunter was only able to provide the first nine pages of the grant. The page explaining the financing was missing. Neither the County Attorney, the County Manager, Economic Development Chief Glenn Hunter, nor any of the 5 had a copy of the lease agreement between HAECO and Lake City before they sat down on February 9 to decide whether to give the City almost one-half a million dollars. The application, which was filled out by Roland Luster, City Manager Wendell Johnson's handpicked successor to former Airport Manager Nick Harwell, was not complete. The employee parking lot portion of the RIF grant was renamed an Internal Transportation Improvement. According to Glenn Hunter, the funding and contributions had not been worked out before the meeting. In 1947 and 1948 Lake City acquired control of the airport and all of its buildings from the United States government. Beginning in 1961, throughout the years there were various leases with tenants for the use of the hangars, hangar area, and the runways. Over the following decades the rent at the airport varied, from a low of zero to approximately $8,300 per month at the present time. At all times the rent was for seven hangars (designated H1, H2, H3, H4, H5, H6, H7, and H9) and the use of all taxiways and runways. During all leases the lessees, (the folks that leased the property from the City) were 100% responsible for the maintenance of the hangars, etc. The lease gave Lake City the authority to inspect the leased property, which included the hangars. It is not known if it did. In 1961 lessee AERO built a hangar for its business at the airport and Lake City waived the rent for ten years. 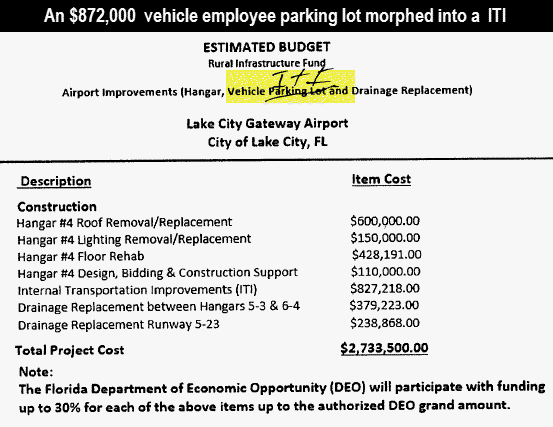 In 1993 the City applied for and received a $2,000,000 FL Economic Development grant for a $2,124,000 airport renovation ($3,528,000 in 2016 dollars). AERO contributed $124,737 ($207,187 in 2016 dollars). The problem was that the taxiways and taxi lanes were degraded and would not accommodate the new wide-bodies, which at that time were the DC10 and the L1011, which empty weighed respectively 245k lb and 240k lb. In 2004, TIMCO, formerly AERO Corporation, was paying $2,500 a month to rent seven hangars and the use of all taxiways and runways. In 2011, TIMCO had a loss of $12 million. In December 2014, the Columbia County 5 donated $474,250 as part of a $1,355,000 grant to Lake City to refurbish two hangars. In February 2014, HAECO bought TIMCO Aviation Services for $388.8 million. Established in Hong Kong in 1950, HAECO is one of the world’s leading independent aircraft engineering and maintenance groups. It is one of the largest Maintenance, Repair and Overhaul (MRO) service providers in the world in terms of capacity . As of June 2016, HAECO had revenue of $7.1 billion, a 23.9% increase over the prior year. Its profit was $274 million, a 22.3% increase. In the same time period HAECO's earnings per share were up 337.4%. HAECO's Kip Blakely explains HAECO-TIMCO to The 5. Mr. Blakely didn't explain why the hangars had leaky roofs and needed new floors. County Manager Ben Scott kicked off the meeting. Mr. Scott introduced Economic Development Director Glenn Hunter, who introduced TIMCO-HAECO's Kip Blakely. It was not clear why Mr. Hunter did not present the project, as he is the County Economic Development Director. However, it is understood that Jeff Hendry of the NFEDP and the IOG and a prime mover in the NFBA $30 million dollar broadband debacle, along with Diane Scholtz of the FSU Institute of Government (IOG) arranged the last minute Rural Infrastructure Fund grant. Mr. Blakely showed a few PowerPoint slides which explained how great a company HAECO is. He showed a picture of the hangars in use by HAECO and presented a not so clear graphic which showed HAECO's present and future staffing. A close look at HAECO staffing reveals that between June 2016 and January 2017 HAECO's workforce (HAECO numbers) has increased, but the greatest percentage increase of employees has been contractor provided. In June 2016, HAECO had 596 full time employees (FTE) and 55 contractor provided employees (CPE), giving it a total workforce of 651. The next month in July, FTEs decreased to 588, but CPEs increased to 128, a 233% increase. Through January 2017, FTEs increased to 715, while CPE's increased to 222. CPE's were almost a third of the HAECO workforce. Under the leadership of Com. Nash, the study was recently updated and the findings massaged to dilute the facts. It is well known that HAECO is having a horrific time finding a qualified and reliable work force. Housing has also become an issue for HAECO, with Mr. Blakely recently traveling to Suwannee County to survey the housing availability situation there. HAECO is predicting that by December 2017, it will have an 1100 member workforce: 868 FTE's and 232 CTE's. 27% of the HAECO workers will be contract workers. There were no serious questions from the County 5. All appeared ill-informed and unprepared. It was apparent they knew what they were going to do before they walked into the meeting. Commissioner Tim Murphy did try to get into some detail. It was obvious that he was unfamiliar with the details of the grant as he asked about the roof replacement on hangar 4 [as spoken]: "Now hangar 4, it says here 6 -- roof replacement -- 600 grand -- no six million -- no -- 600 grand, right?" Mr. Murphy continued, "Are you knowledgeable on what you're gonna' do for 600 grand? I'm not talkin' about detail -- I mean -- you just changin' the panels out for 600 grand?" Mr. Blakely: "It would be a total roof replacement. Currently that facility leaks and we're not able to put an aircraft in there for maintenance." On January 1, 1993, AERO entered into a 30 year lease with the City. It expires on December 31, 2022. All the lease documents between the City and AERO-TIMCO-HAECO are clear. The City has waived all City taxes on the "leased premises." The reason is stated in the lease: "City agrees that Aero is currently performing certain municipal functions on the leased premises and may, from time to time, perform other municipal functions." The lease gives the City the authority to "periodically inspect the leased facility." The lease is crystal clear regarding maintenance of the buildings: "Aero shall at all times during the term of this lease maintain and keep in good repair all of the buildings located upon the leased premises." Your reporter asked Mr. Blakely, "Late this afternoon I got a copy of the lease... and it says you guys are responsible for the maintenance of the hangars. Why is the roof leaking? Why does that hangar have to be rebuilt if you are responsible for the maintenance?" Mr. Blakely responded, "You've read a lot more of the lease than I have. I can't answer that. I don't know what the definition of maintenance is on that." Your reporter followed up, "It says you're responsible for the hangar." Mr. Blakely responded, "Which we've been spending millions of dollars on for many, many years." An entourage of City brass was in attendance which included City Manager Johnson, Asst. City Manager Grayson Cason, veteran City Councilman and Chairman of the Airport Committee George Ward, and the anointed Airport Manager Roland Luster. None of them mentioned a word about the lease; how the hangars became rundown and the roofs leaked; and if they ever made inspections of the premises. Lake City, Columbia County, and the state of Florida are continuing to spend millions of local and state dollars to renovate deteriorating leased buildings, which for decades, Lake City has been responsible for inspecting and HAECO-TIMCO has been responsible for maintaining. As the meeting was wrapping up, Mr. Blakely explained that HAECO will soon be replacing "200 to 300 people a year" due to retirement. It is not clear how they are going to find those replacement workers. None of The 5 was curious. 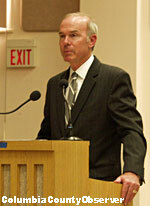 Before the County 5 voted, County Attorney Joel Foreman had a question regarding the ITI grant and its funding. Economic Development Director Hunter replied, "We still have a few questions on the ITI grant, so we're trying to get the dollars worked out from the state on that." 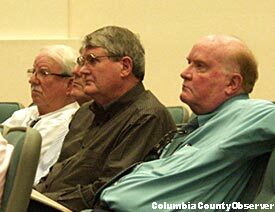 This new information did not faze the infamous Columbia County 5, who voted to gladly give away almost a half-a-million Columbia County taxpayer dollars, unanimously, without missing a beat or doing its homework. The Columbia County 5, the legend continues. Dear Editor, After reading the article about the airport hangars and their condition immediately reminded me of the Blanche. Obviously the City Manager should bear the responsibility for the upkeep of all City owned or leased properties, including the airport hangars and the Blanche. • HAECO Ready in Columbia County: "Moldin' Kids In a Certain Way to Provide a Workforce"
• Columbia County Economic Development: "We don't have a workforce strategy"